Migration and refugee flows are intrinsically of the same nature, only differing in the degree and intensity of the problems that drive them from their homes. These root causes can be summed up as being poverty with little hope of change, social tensions − some created for political reasons − and environmental degradation. These root causes created “the uprooted” with resulting alienation and suffering. 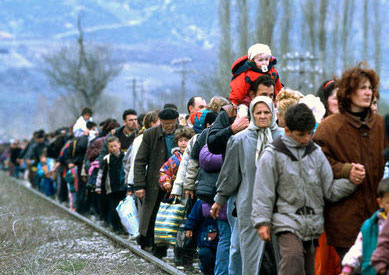 Some are uprooted and stay within their own country − now called “the internally displaced”. When they cross State frontiers, they become migrants or refugees and thus a concern to neighboring States and the United Nations − in particular the Office of the High Commissioner for Refugees (UNHCR). Ideally, there needs to be successful conflict resolution efforts in armed conflict zones such as Syria-Iraq and land reforms, greater emphasis on rural growth, improved access to credit for the poor, environmental protection and a pluralistic political order in Burma (Myanmar) and Bangladesh. The same measures for ecologically-sound development and overcoming vulnerability should be taken in the African countries whose citizens join with those from the Middle East in trying to cross the Mediterranean. Ideally also, there should be a channelling of greater efforts and resources directed towards meeting the basic needs of people in their home countries. Yet conflict resolution takes time. There are few signs of an end to the armed conflicts in Syria-Iraq or to the establishment of a stable and just political order in Libya. Transition to a democratic and pluralistic government in Myanmar, granting dignity and respect to all the “national minorities” is likely to ba a long process. It is not clear that the military who have ben in control since 1960 will be very helpful. Ecologically-sound development is also slow even when governments are relatively competent. Faced with the problem of the arrival of refugees and migrants, neighboring countries have often hardened their responses and created growing restrictive measures. There has been a growing emphasis on the punishment of traffickers who profit from the migration flows and to an extent encourage it. In Europe, we have seen the growth of anti-migration proposals by political parties, usually parties in opposition but at times as part of governing coalition governments. Nationalist discourses are reinvented and reasserted. We have seen the tightening of immigration controls and the deportation of “illegal entrants”. Australia and Israel have followed the same practices. The consequences of these methods lead many refugees and migrants to live extremely grim, inhumane and uncertain lives, unable to find regular work and the children unable to go to State-run schools. Fortunately, there has been a response from non-governmental organizations (NGO) to the challenge of the increased number of refugees and migrants. Often it has been a spontaneous effort of good will by persons who have met a refugee or migrant. But such efforts by NGOs need greater support and coordination. Action groups need to be able to act at the same time in more than one country. Transnational action by NGOs is needed, especially as governments within the European Union meet among themselves, often to adopt common restrictive policies. The same is true of the Southasian States in ASEAN, some of whom have met these days in Thailand to discuss how to cope with the refugee flows. Thus we face a double task: peace, reform, development in countries from which refugees and migrants leave and a coordinated policy of help, support, and integration in the countries receiving the refugees and migrants. These are urgent tasks − vigorous and coordinated actions by NGOs are needed. Rene Wadlow presents the case from an NGO point of view. He suggests that the distinction between refugees and migrants is an artificial one. In theory, the refugee has been pushed out of his or her country whereas the migrant has been pulled out by the promise of a better life abroad. In practice, the two categories cannot really be separated. The Syrian refugee arriving in Europe does not want to remain in Greece, Malta or Cyprus: he or she wants to proceed to, say, Sweden because of the promise of an easier acceptance and a better life. Hence, the Syrian refugee may have considered both a push and a pull factor when deciding to leave Syria. On the contrary, a Yemenite may not know any country bordering Yemen where he (not to speak of she) could hope for humane treatment and a minimal livelihood. If he decides to leave Yemen he would be acting on a push factor alone. In the case of economic migrants it is often not sure that they act on a pull factor only. Frequently, there will be other circumstances giving them a push, maybe even the decisive one. Discrimination of Roma in Balkan countries, of nomads in African countries, of religious and ethnic minorities anywhere: discrimination is not the kind of persecution in terms of lethal danger which would lift the migrant into the higher category of refugee. Discrimination or persecution? A difficult distinction to be made by immigration officials deciding on the fate of thousands now, perhaps millions in future. Also, there are other circumstances which could create a powerful push factor during the process of migration. Someone who has crossed the Sahara or the Sudan on the way to the Mediterranean may have had terrible experiences making a return trip unthinkable. Someone who sold a kidney in Khartoum to obtain the money for the trip to Italy: the Libyan coast is full of people who started out as economic migrants but are now in such a desperate situation that they would rather buy a place on the flimsiest boat of the cheapest smuggler than attempt to return. The pull factor has turned into a lethal push factor. But immigration officials won't recognize and accept that. There are also those migrants who destroyed their documents in order to pose as refugees. The government of Eritrea says many Eritrean refugees were in reality Ethiopian migrants. Since the same tribes live on both sides of the border, the same languages are spoken and written, the oppressive government is using this fact as a convenient excuse. However, immigration officials are often challenged to determine the real nationality of an applicant for asylum; a lengthy and costly process. With rising numbers of illegal immigrants and a growing backlog in processing them, practices tend to become summary: Eritreans yes, Ethiopians no. Who can't prove to be Eritrean could be considered Ethiopian. Like many observers, Wadlow recommends assistance to the countries of origin of economic migrants, the 'pull countries' as it were, to reduce the strength of the pull factor, and political action in 'push countries' to reduce or eliminate the push factors. How difficult this approach is even within the European Union is exemplified by Bulgaria whose poverty persists and whose Slavic and Roma ethnic groups are clashing, pushing out the minority. The pull factors are becoming stronger by the year. As television and internet are spreading in Africa and Asia, more villages, more people become aware of the image Europe's entertainment and commercial programs are presenting. People living in ample modern homes, driving luxury cars. traveling to distant places, enjoying sports and beach life, collecting art. How does this paradigm of life impact a boy in a thatched hut without running water and electricity in, say, the Ethiopian highlands, several hour's walk away from the nearest school? A boy who does not know the operative end of a screwdriver because he has never turned a screw in his life but who saw some entertainment programs on the school's TV set? Even in developed countries such as Germany, the pull factors can be enormously strong. The East German state collapsed because the eastern population wanted the German Mark currency immediately after re-unification. The little money they had they splashed first on bananas and later on cars. They wanted the western standard of life as they imagined it, right away. Only later they discovered that this standard was far from perfect, deprived them of some conveniences, and hurt some of them badly. So much for the Germans. But who is going to tell the boy in the thatched hut what the European paradise he imagines is really like? If he knew what lies ahead for him before reaching Europe, and what afterwards, he might bury his dream. But no-one tells him. The pull factor rules supreme. Yet, there are some very modest, low scale initiatives undertaken. Donor-supported “community conversations” where people discuss the harsh realities of illegal travel, are effective at putting off potential migrants in Ethiopia, according to a spokesperson of the Prime Minster's Ofiice. This kind of effort is needed on a global scale in Africa, Asia and Latin America, making use of modern media, and focusing on the hazards of both internal and international migration.